Matty Blair would view another mid-table finish for Doncaster Rovers as a failure. Within the confines of the Rovers dressing room there is a feeling that Rovers can push for a top six spot this term. 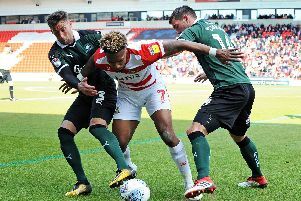 Those promotion credentials will come under the spotlight this weekend and next when Doncaster face League One pacesetters Portsmouth and then Peterborough United. Blair is adamant that Rovers, who finished 15th last season, can set the bar high. “Obviously we’ve had a new manager come in and it’s a new style and everything else,” he said. “But I think I would [see mid-table as a failure] because of the group of players we’ve got. “I said it last season before Darren [Ferguson] left that we’re only a couple of players away from giving this league a right go. “The gaffer’s brought in great quality and I think we will start to prove now why we should be higher up the league and pushing for promotion. Among the new recruits is teenage midfielder Herbie Kane who has impressed since arriving on loan from Liverpool - and is keeping Blair out of the team. “That’s why I said I can’t be frustrated I’m not playing when the gaffer’s bringing in a player like Herbie, who I think has been outstanding. He’s been different class. “To know that I’m actually pushing him for a place is like a morale boost for me, knowing the gaffer would actually play me if he starts to dip a bit. New boss Grant McCann, 38, is only eight years Blair’s senior and the winger feels that could help create a strong connect in the changing room. He said: “With him recently just finishing [as a player] he probably has a better understanding than say an older manager in how the modern day changing room works. “So he may see things differently to a manager who has been managing 15 to 20 years who might have an old school approach. “So that can benefit a squad and a club.